Labasa failed to grab a win at home against Suva during the Rewa Galaxy Premier League match at Subrail Park yesterday. In the 8th minute, Ravinesh Karan and Ilisoni Logaivau were given ample opportunities to score but shot wide. Former Labasa rep Maciu Dunadamu, who now plays for Suva, also had good opportunity to score for the capital side but failed to find the mark. In the 57th minute, Posiano Kalisito had a chance to put Labasa in the lead, but his attempt was saved by Suva goalkeeper Ulaiyasi Tamanisau. Basic mistakes by both teams cost them. Star turn: Ravinesh Karan displayed excellent attacking skills throughout the game but defence from the Suva team was good. 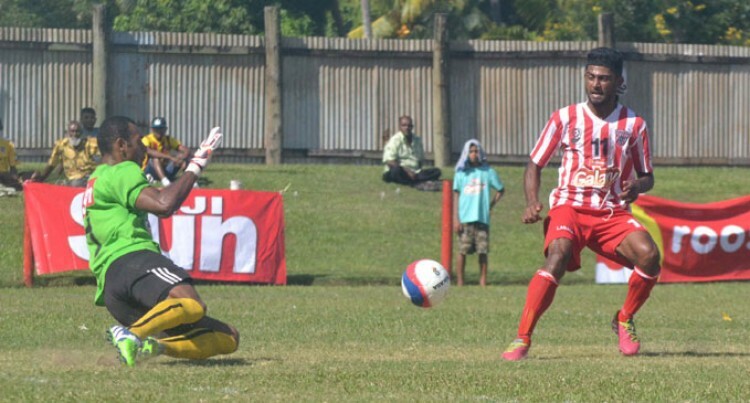 Big play: Suva goalkeeper Ulaiyasi Tamanisau made good saves to prevent Labasa from scoring. Labasa coach Bal Sanju Reddy said: “I’m quite happy with our performance because Suva’s always a tough team to beat. But a point is better than a loss. The boys made so many attempts but failed. Suva coach/player Pita Rabo said: “I take my hat off to the boys. Going back to Viti Levu with one point is more than enough. Labasa played a good game in front of their home crowd.